Reade Signs were proud to sponsor a World Book Day art competition held at local secondary school Fernhill. 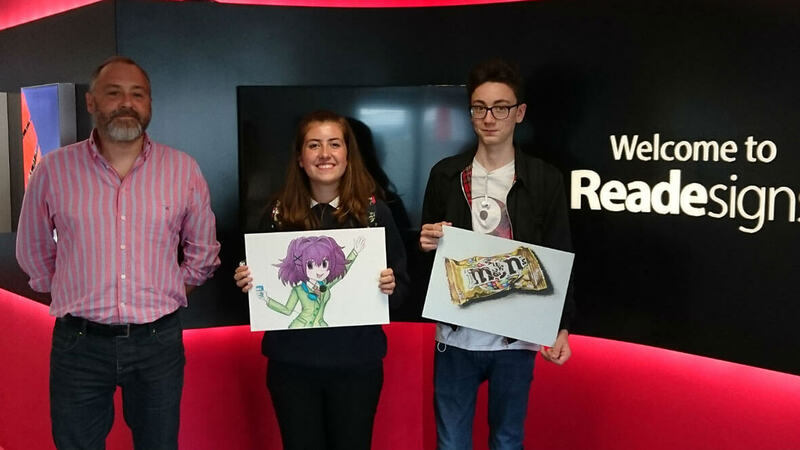 Reade Signs had quite a task on their hands in judging the entries and were pleased to announce that students Dylan and Louise were the lucky winners. Their prize included a tour of the recently refurbished and rebranded Reade HQ, where they met friendly and knowledgeable staff members from the Sales and Marketing, Design Studio and Production Teams. The Studio Team worked alongside Dylan and Louise to guide their artwork through the design and production process and demonstrated the numerous solutions that can be offered to clients. The students then watched their artwork take shape and form as it came out of the large Vutek printer on Foamex ready to take home. “We are extremely grateful to Reade Signs’ sponsorship and support – they really did go ‘above and beyond’.